Our High Performance EVO™ 7" LED headlights are specifically designed for use with Land Rover Defenders. The anti-flicker harnesses prevent radio interference and contain technology that eliminates flickering caused by the CAN-BUS electrical system on later models making these headlights simply plug & play. Our EVO™ LED Headlights offer 4000lm (High Beam) /2400lm (Low Beam) and are easily adjusted using the standard Land Rover headlight adjustment bezels. Instantly upgrade the look of your Defender with our road legal & E Marked LED lights. This technology combines your Low and High Beam when turning on your High Beam. By combining the Low and High Beam, the Dual Glow optics provide you, the driver, with both widespread visibility of the road ahead as well as a powerful spread of light. 12v ECE headlights RHD. High & Low Beam. 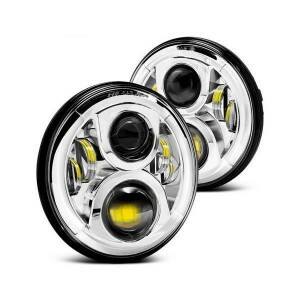 The headlights are IP67 rated. Simply put; they are water/dust proof and can withstand being submerged underwater for 30 minutes without damage. Ideal when off-roading. To be ECE-compliant guarantees your lights are compliant in the European Union and in non-European countries that have adopted ECE Regulations for visibility, durability, and reliability. All of our LED Headlights are sold in pairs. Product dimensions and specifications of our 6500™ 7" LED Defender LED headlight.